Updated figures suggest that the Chinese air force is shrinking. It’s building smaller numbers of newer jets. The aerial arsenal of the Chinese People’s Liberation Army shrank by nearly a quarter over the past year, from around 3,400 combat aircraft to just under 2,600. The best assessment of the secretive PLA, a database managed by Flight International magazine and updated annually, showed 800 fewer jet fighters in the PLA inventory compared to a year ago. The reduction reflects "improved data," according to Flight's annual report, released late last month. The data allowed the report's authors to remove from the PLA's active rolls a "combined 850 obsolete Harbin H-5 and Nanchang Q-5 combat aircraft." The H-5 and Q-5 date from the mid-1960s. It's unclear exactly when the PLA retired the two models. The PLA isn’t alone in shedding combat aircraft. Most of the world's major air arms are slowly shrinking, owing to decreasing military budgets and the tendency of planners to favor small numbers of high-tech new aircraft over larger numbers of less-sophisticated, older models. The U.S. Air Force is replacing more than 400 F-15s with just 187 newer F-22s, for instance. China built hundreds of H-5s and more than 1,500 Q-5s, but has built just 300 or so combined of more recent warplanes such as the J-10 and J-11. The PLA’s warplane holdings have apparently contracted at an even faster rate than the Pentagon's, growing the gap between the two aerial powers and cementing the U.S. military's position as the dominant aerospace power. The U.S. Air Force, Navy, Marine Corps, Army and Coast Guard together operate 13,000 manned aircraft. Number two Russia operates 3,600. 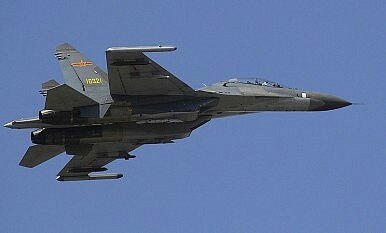 China, in third place, possesses 2,600 warplanes. Of roughly 5,400 warplanes on firm order as of late 2011, the Americans accounted for 1,700. "This [U.S.] dominance shows no sign of being diminished for many years to come," Flight reports. After protesting a U.S. Navy freedom of navigation patrol, the PLA flexes its airpower muscles in the South China Sea. Will Russia Build Borei B-Class Ballistic Missile Subs? The head of the Rubin Design Bureau says Russia will begin building more advanced subs than the current two Borei-class variants.